IT infrastructure can be complex. Imagine how much time and money you could save if you could eliminate infrastructure complexity. What if you could implement virtualization at your branch offices? How about consolidating and optimizing application environments? Why is a converged infrastructure so powerful? A virtualized infrastructure greatly simplifies your IT infrastructure. Fujitsu PRIMEFLEX® vShape® is the best solution for doing this. Fujitsu PRIMEFLEX vShape enables you to use less hardware and attain more efficient use of your IT landscape, thus reducing operational costs and improving service levels. Fujitsu PRIMEFLEX vShape also focuses on performance and scalability, offering good data availability, automation and component redundancy. This single solution delivers reliability, peace of mind, and less risk. Fujitsu’s experience helps shorten implementation times while reducing risk in integration to your existing data center. 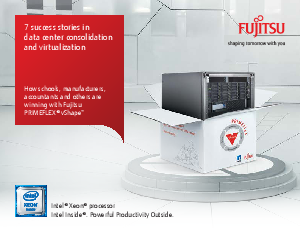 Read the Fujitsu PRIMEFLEX vShape brochure.